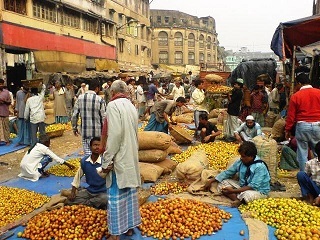 Azadpur market (mandi) is one of the biggest Fruit & Vegetable market in Asia. This is the market of state-run significance as it has understood the a National Distribution Centre for important fruits and vegetables like Apple, Banana, Orange, Mango, Potato, Onion, Garlic & Ginger and many other vegetables. On 7th January 2004, it was announced as Market of National Importance in India. It is also one of the biggest wholesale markets in northern India. Farmers come from all parts of the country to sell their produce here. 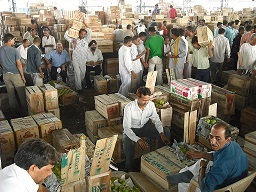 Hundreds of workers unload product that has just arrived by rail and road, from farms across the country, almost all the fresh agricultural produce are transported from Jammu & Kashmir and Himachal Pradesh, the northern hill states of India. Azadpur Mandi is crucial for earning revenues for India and it is also the hub of traders and businessmen. Azadpur Market has been established in 1977, by DDA or Delhi Development Authority, who have also alloted various shops to a number of traders in the market. The entire area of Azadpur Mandi covers more than 90 acres, which includes all its locations. Every day roughly 50,000 people visit the market. Main Objective of the Azadpur Market is to facilitate marketing of fruits & vegetables and implement regulation meant for safeguarding interest of farmers, producers/sellers and consumers.